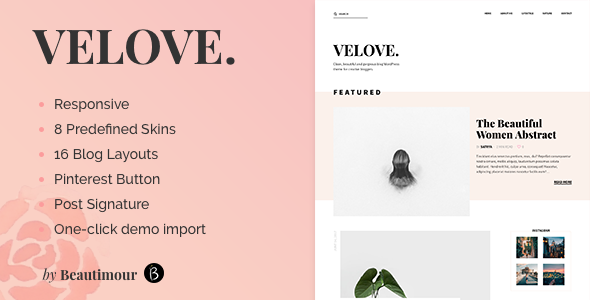 Velove is a fresh, beautiful, personal and modern WordPress blog theme perfect for blogger who love fresh and unique layout. It also comes with fresh and beautiful colors and typography to make your blog more attractive to your visitor. We provide in-depth documentation detailing theme installation, feature usage, configuration options and demo setup at https://beautimour.com/documentation/velove/. If you have any questions, please use the contact form on our profile. We will answer all tickets within one business day.